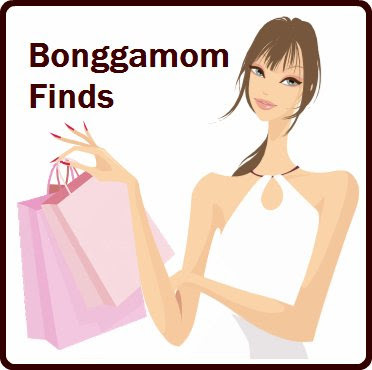 Finding BonggaMom: Who Rolled My Cheese? But it isn't like rolling Easter Eggs, oh no. 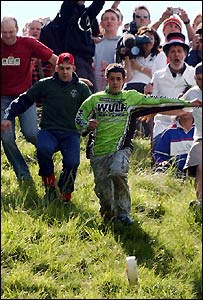 The Master of Ceremonies "releases" a 7-8 lb wheel of Double Gloucester cheese down the hill, yells "Go! 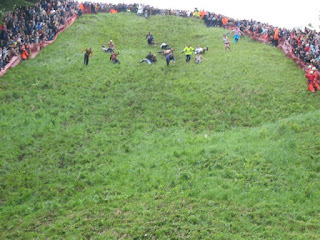 ", and the competitors launch themselves off the hill and chase after it. The first one down the hill wins. 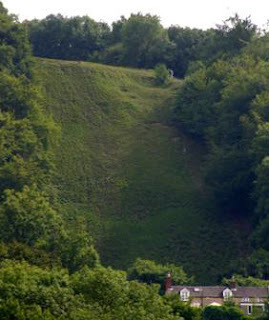 And did I mention that this hill is STEEP? It's 200 m long and has a 2:1, sometimes 1:1 gradient. No wonder that scores of people get injured every year -- sprained ankles and fingers, broken bones, even head injuries to spectators who get hit by flying cheeses. I can't help smiling as I read that last sentence, but I'm sure it's not funny to the person who gets knocked unconscious by a wheel of cheese. Yet thousands of spectators and dozens of competitors go back, year after year. The reward for this great effort? Third place gets 5 quid, second place gets 10. The winner gets the cheese. Not sure if it's the actual cheese that rolled down the hill, or if he/she gets a fresh cheese. And I thought Bay to Breakers was a crazy race. interesting... and look at that crowd! grabe! Very interesting!! :) I want to go now!! Oh, I have seen this one before on TV. It's amazing how many people join the event despite the risk of getting hurt. This is hilarious, thanks for sharing. And, I really hope the winner gets a new cheese. Not sure if I'd want to pick off the grass stains! Interesting and looks like a lot of fun! Except for the injuries sustained, of course. hahaha. that is so funny! This is one of the funniest things I've ever read on a blog.